Sukhothai is a city in central Thailand and home to Thailand’s first ancient captial. For lovers of history and culture Sukhothai is a must visit and we’d encourage anyone to add Sukhothai to their Thailand itinerary. However, getting to Sukhothai isn’t so easy, it’s a little off the main train lines, so buses , private tours and transfers could be what you need. 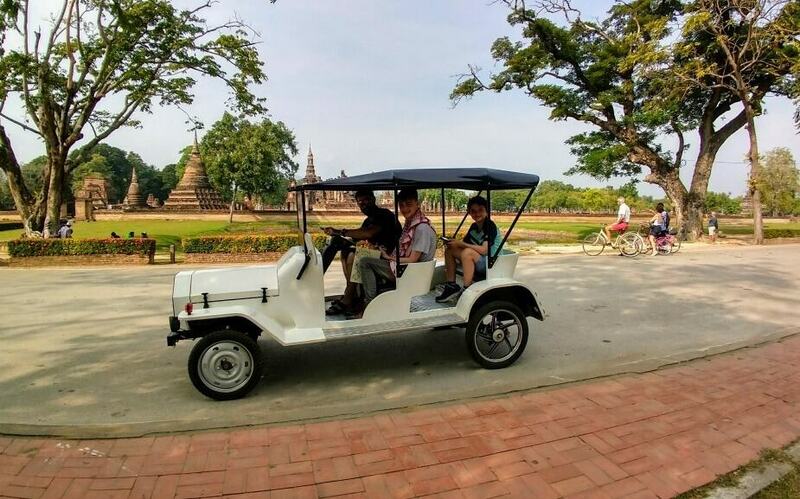 Information on visiting Sukhothai, touring the UNESCO listed Sukhothai Historical Park, where to stay, touring by bike, golf buggy and more. 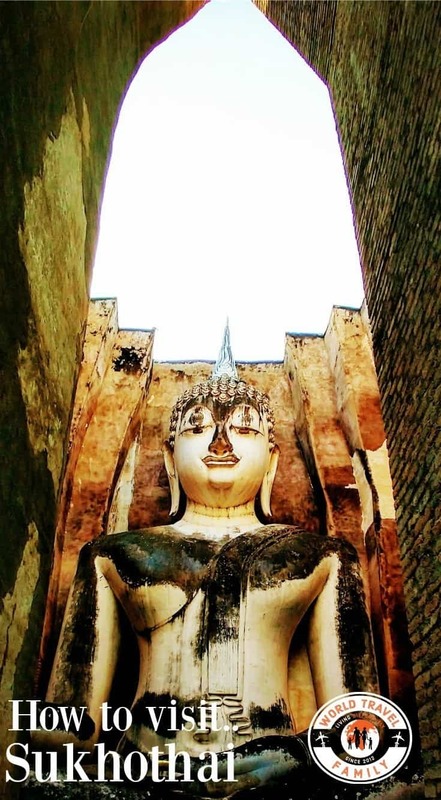 Everything you need to know to organise a trip to Sukhothai Thailand. How to Visit Sukhothai? Bookmark to Pinterest Now! 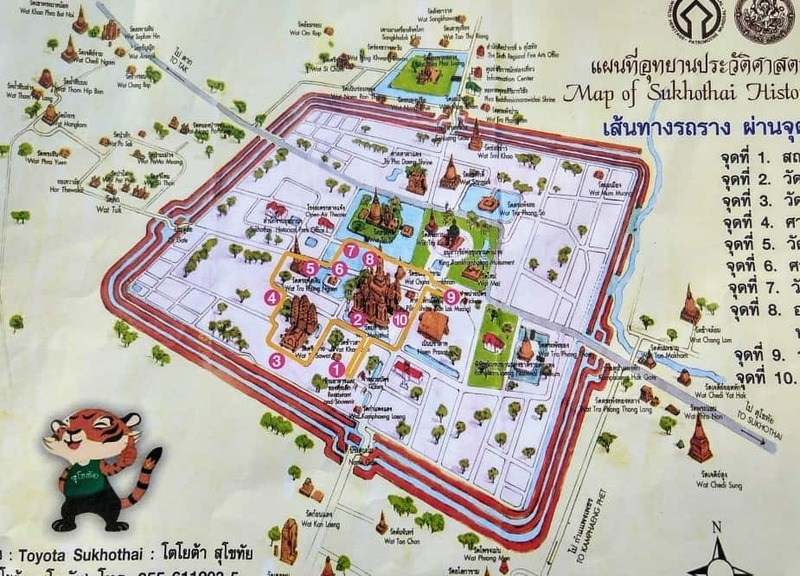 Our map of the Sukhothai Historic Park area given to us when we toured by golf cart. The yelow route, marked, is the path around the main ( central)area. The numbered stops are tram stops and/or parts to stop and visit. The site is vast and sprawls, as you can see there are plenty of points of interest. Some of the most amazing parts of the Sukhothai complex lie outside these triple walls and you’re going to need time to see them all. The ticketing and admission fees for the Sukhothai area are a little complex. There are two main zones, northern and central. The central zone is the area with the yellow route marked above, the northern zone is the area with the moat north of the main city wall. There is plenty to see for free as monuments dot the landscape inside and outside the city walls. At dawn ( while running) we could explore much of the northern area without buying a ticket, but later in the day we bought a ticket for the same area with the addition of Wat Sri Chum ( see below), which is fenced and guarded. Tickets come in various combinations. The main ( central) area is tightly fenced and has designated opening times, we were unable to get in there for sunrise at all, but sunset is recommended. Outside town there is a sunrise point ( Wat Saphanhin, top left on the map above) that is possible with views over the landscape and the Wat’s own standing Buddha. There is a ticket for this, but my husband, again running, didn’t need one. We left almost as confused about tickets as when we arrived, but we’ll say that it is very much worth buying all of these tickets, don’t skip them because of cost. Of all the places we’ve been in Thailand I think Sukhothai is our favourite and it would be great to have several days to explore fully, on our last visit we only had 2 full days, 3 nights. Sukhothai. This Buddha is depicted walking with his right hand in the gesture of reassurance and safety (abhayamudra). It’s pretty unusual to see a Buddha image that isn’t standing, sitting or lying down and the walking Buddha statues are quite characteristic of art in the Sukhothai period ( 13th century). You can also see long smooth limbs, flowing clothing and an oval face in this era. Sukhothai was the 13th century capital of Thailand and is the first ancient capital of Siam after unification and before the Ayutthaya era. 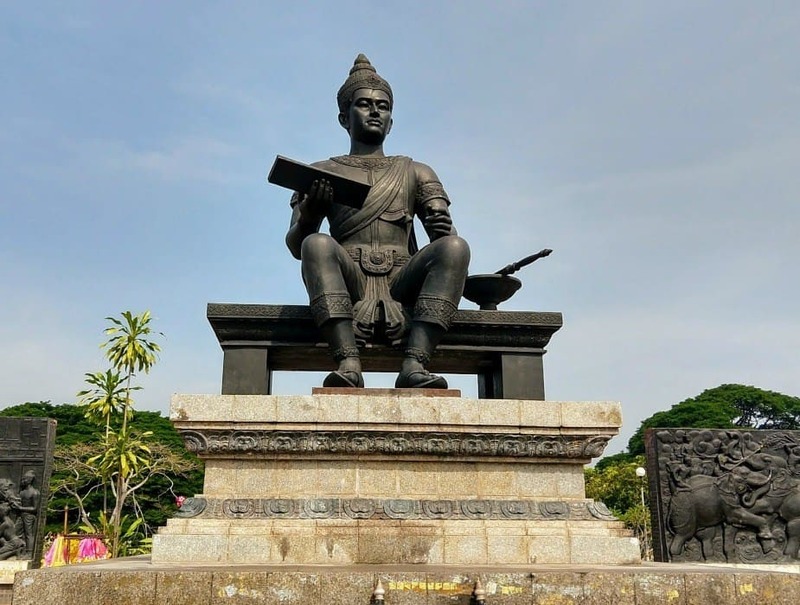 Sukhothai was founded by King Ramkhamhaeng who is credited with introducing the written Thai language. The regions restored and preserved monuments, temples and palaces are collected into UNESCO listed Sukhothai Historical Park. The word Sukhothai translates as “dawn of happiness” and the Sukhothai period has unique features and styles. Sukhothai was capital of Siam for 120 years and saw many kings. King Ramkhamhaeng the Great. An innovator and hugely respected monarch, he laid down the written Thai alphabet for the first time. Always show respect at these sacred and historic monuments. The northern zone of the ancient city of Sukhothai has my favourite monument in the whole of Thailand. 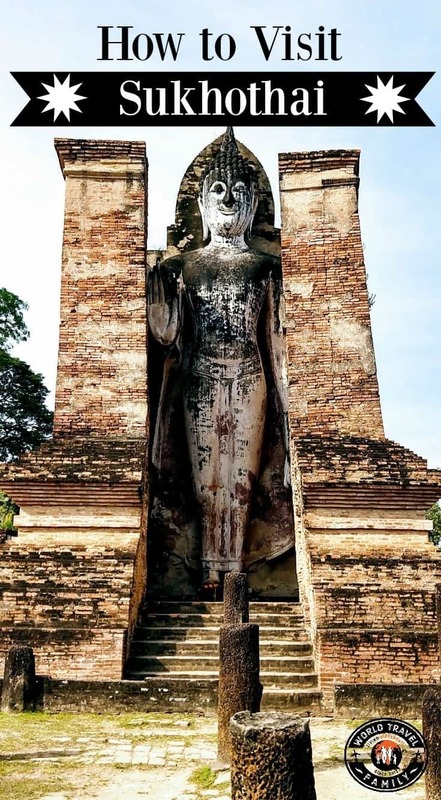 Wat Sri Chum contains a stunning white Buddha who peeks out from his enclosure inviting you to come closer ( see him on our Pinterest image, below). The last time I visited, almost 20 years ago, he was pure white having been recently restored. Today he’s showing the marks of time, weather and birds, but he’s still mesmerising and beautiful. Your ticket for the Wat Sri Chum area also covers the rest of the moated northern zone which contains various prangs and statues. As I mentioned, we didn’t need a ticket to run in this area at dawn, but had to buy one later in the day. Nearby you can also visit Ramkhamhaeng National Museum, Ramkhamhaeng National Park, Sri Satchanalai National Park, and The Royal Palace and Wat Mahathat. The bus from Sukhothai to Bangkok. A very nice bus. How long does it take? See below. If you prefer, you can fly, it’s a lot quicker. Sukhothai is well served by roads, which is just as well with the nearest railway station, Sawankhalok, being approximately 50 km away and Phitsanulok station ( on the more frequently running north -south Thailand train line) nearly 75 km away. Sawankhalok railway station is the closest to Sukhothai but it is still 40 km north of New Sukhothai and nearly 50 km North West of Historic Old Sukhothai. 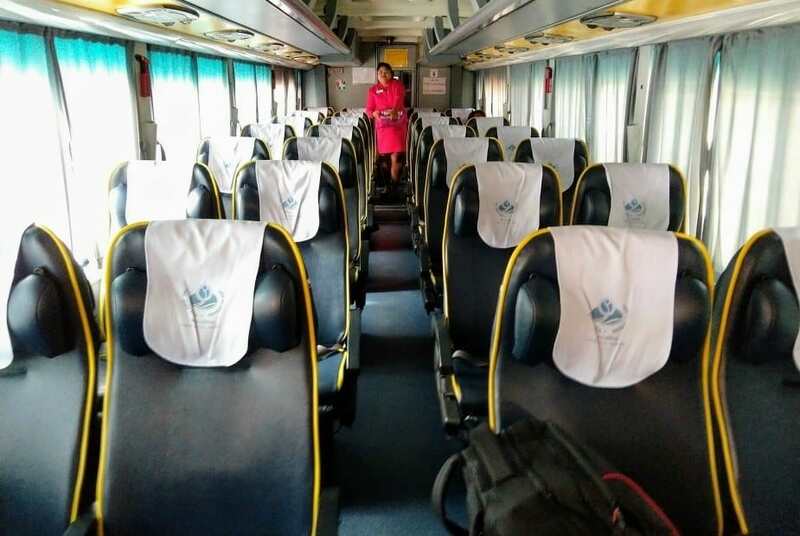 There is one train direct from Bangkok Hua Lamphong Station to Sawankhalok, the journey is almost 7 hours, departing at 10.50 hours arriving at 17:46. Currently there is no direct train to Chiang Mai from Sawankhalok. Buses from Sukhothai Old Town bus station depart to Chiang Mai in the north and both Ayuthaya and Bangkok in the south. The journey to Chiang Mai is approximately 4 hours, upwards of 7 hours to Ayuthaya and 9 hours to Mo Chit bus terminal in Bangkok. There are more departures and arrivals from Sukhothai New Town bus station than from the Old Town. Buses from Sukhothai Old Town tend to be newer, which makes for a nicer ride especially on the 9 hour route to Bangkok. Tickets can be bought in the middle of Sukhothai Old Town at the small roadside bus station and you can even pay with credit or debit cards for a fee. There is also a Sukhothai Airport, although it only services Bangkok via Bangkok Airways. Planes travel in both directions twice per day. Flying time is just over an hour and Bangkok Airways also sell transfers to either the New Town or Historical Old Town. Phitsanulok has another nearby airport, offering more planes. Both Air Asia and Nok Air service the airport. You can get tickets that include a transfer to Historic Sukhothai. Flight plus transfer takes approximately 2.5 hours from Bangkok and costs in the region of 1500 Baht ($47 US). The Historic Town of Sukhothai is a small town that mainly caters for the tourists flocking to see the Historic Park. It immediately surrounds the temples and is separate from the new town which is also called Sukhothai. The new town is a purpose built town along the banks of the Yom River. It is approximately 15 km to the new town from the historical ruins and songtaws make the journey frequently. It is typical of most new towns and doesn’t hold anything for tourists besides some lodging and a few more banks and medical facilities than the old town. If you are just here to see the ruins then there is no need to stay in the new town. Historic Sukhothai has everything you’ll need from accommodation, food, ATMs and even road transport links. We loved staying here ( details below) it’s not expensive, but not rock bottom cheap either. 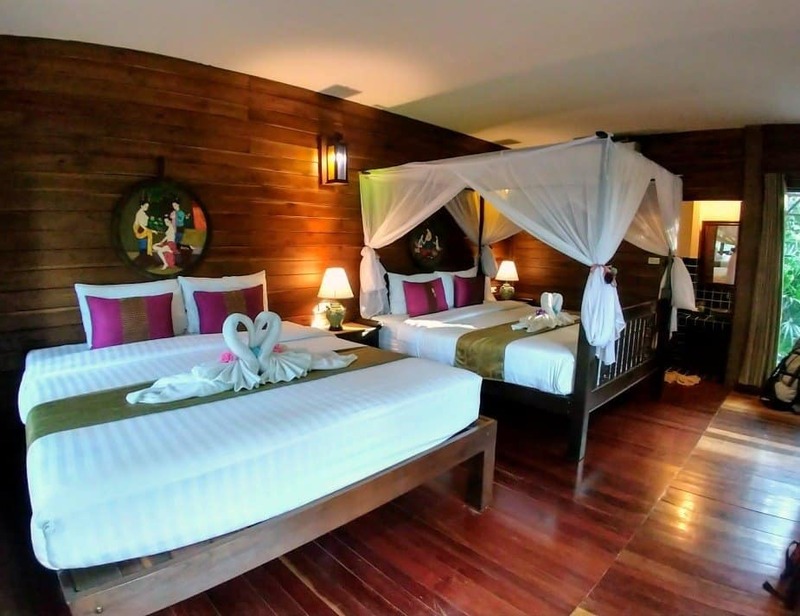 More details on where to stay in Sukhothai below. We want to give a big shout out to this place, Thai Thai, because it was one of the most lovely places we’ve ever stayed in Thailand. It’s hidden away off the main street in a quiet area, but walking distance from the old town. It has gorgeous family rooms ( above) as well as standard rooms for two. The individual villas or chalets stand in pretty gardens, the staff are divine and the included breakfast was very good indeed, including hot Thai dishes, plentiful coffee and the usual western items. If that wasn’t enough, there is also a swimming pool. It’s at a low-mid price budget point, check it out here. There are quite a few other options, obviously, but we liked this one so it gets a mention. The classic way to tour Sukhothai is by bike and there are places to hire them all over town. Your hotel, hostel or guest house may even loan or rent you a bike. Parts of the site, beyond the main walls, are free to enter and it’s lovely to tour these solo by bicycle. My husband and I run, so we got out to these areas at dawn, on foot. It’s quiet and stunning before the other visitors are awake. You can also tour the main Sukhothai site, inside the main ticketed area, by bike. We chose the golf buggy option below. You can tour independently or arrange a guide and tour. It’s hot, be prepared for that with sunscreen, protective clothes and water, but the distances aren’t huge and mostly the roads and paths are very quiet. We did see a serious, probably fatal, accident here, a local guy riding a scooter collided with a turning car on the main road. I’ll never forget the sound of skull hitting tarmac. Wear a helmet. If you want to get the most out of any historic site we firmly believe that it’s best to have a guide. We’ve learned this through experience. Sure, enjoying the beauty can be done solo and you could read up on all this before you go, but we always love paying somebody to show us around. Our friends at TakeMeTour have local guides waiting to show you around, take a look here ( signing up gives us both a discount I believe). Our other favourite tour provider, GetYourGuide, had nothing for Sukhothai at the time we checked. If you head to Trip Advisor there are tour recommendations for Sukhothai bicycle tours here. I’ve had a look at Viator too, there isn’t a huge amount available by way of pre-bookable Sukhothai bike tours, but they do have multi day THailand trips that include Sukhothai. See those, and what else Viator can offer, here. Just hover over either of the images below and click to save to Pinterest to use later. Which do you prefer? Or pin both. My old friend. Find him in the northern area, he’s very special indeed. This standing Buddha is also in the northern area, but if you come around dawn you can see him for free as we did. Only Wat Si Chum ( above) is fenced off. But that part is the best so you should buy a ticket. It was fun! Sukhothai is big and hot so we chose to take the easy option. We only took our golf buggy or cart for an hour at the main Sukhothai site and it was just enough time to see everything. 2 hours would be much better. Near the entry gate of the main historic park, you can hire a golf cart for an hour or buy tickets for the hop on hop off tram tour. If you are taking a bike into this area there is a small additional entrance fee. The sites are huge and it gets very hot. Also there are quite a few places where it would be easy for young children to fall from the ruins. Keep a close eye on your kids and be prepared for heat, sunburn and dehydration.It could be very temping for children to climb where they are not supposed to. In some areas it’s expected, in others forbidden. Because the site is huge and we did it over 2 days, my boys were pretty much ” templed out”. We had to hit the Historic Park in short bursts with plenty of down time in between to keep them sweet. The long bus ride to and from Sukhothai also wasn’t a winner with them. We thought touring by golf buggy was ideal for the kids, shade, a cool breeze and far more fun than walking. 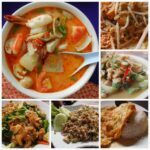 Thanks for reading and we hope we helped you enjoy your visit to Sukhothai. Thailand’s Ancient Capitals are incredible and well worth your visit. 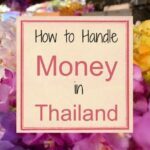 If you’re looking for more information on travelling in Thailand, head back to our main Thailand travel, or Thailand with Kids, pages. If you’re trying to put a Thailand itinerary together that includes Sukhothai, we have that too, just click the links above. Sukhothai is among one of the ancient towns in Thailand that offer immense tourist scope to the travelers. 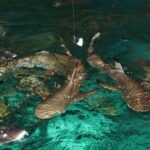 This blog provides a detailed guide regarding this place along with how you can visit and where you can stay. I found the point of exploring Sukhothai by golf cart or tram very interesting.